Master Bathroom – Before and After! Plus some color lessons. Since I’m on a kick to show you before and after Bathroom pictures, I thought I’d post on my Master Bathroom. 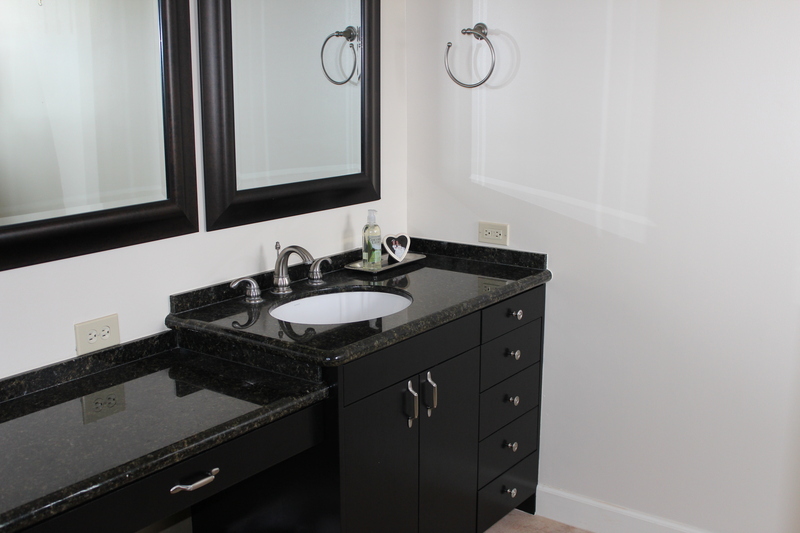 It was actually my second bathroom makeover project, but the one that made the most difference to me, since it’s mine! Now just FYI the shower tile is also a pinky beige, but lighter than the floor tile. There are also accent tiles in the shower that are small, but they include black, olive, navy, maroon, and more lighter pinky beige. Most of my friends are. They said, “I’d never think to paint the cabinet black”. But it eliminated a HUGE color problem (Hello ORANGE cabinet and GREEN walls, I’m talking about you) by reducing the number of colors in the bathroom overall while still coordinating with the countertop. Mostly missed by people is the fact that for the wall color I picked a very light (almost white) beige with slight pink and yellow undertones which is picked up in the tiles and neutralized the greens that were on the wall previously. Picking the right white, beige, or the ‘new’ beige, gray, is hard. The lesson (thanks, Maria) is to choose only a small handful of colors for any one space and to make sure that everything you pick RELATES to the colors already or permanently in the space (like countertops and floor tile). And I’d love to have you follow me via email or on Facebook or Twitter! 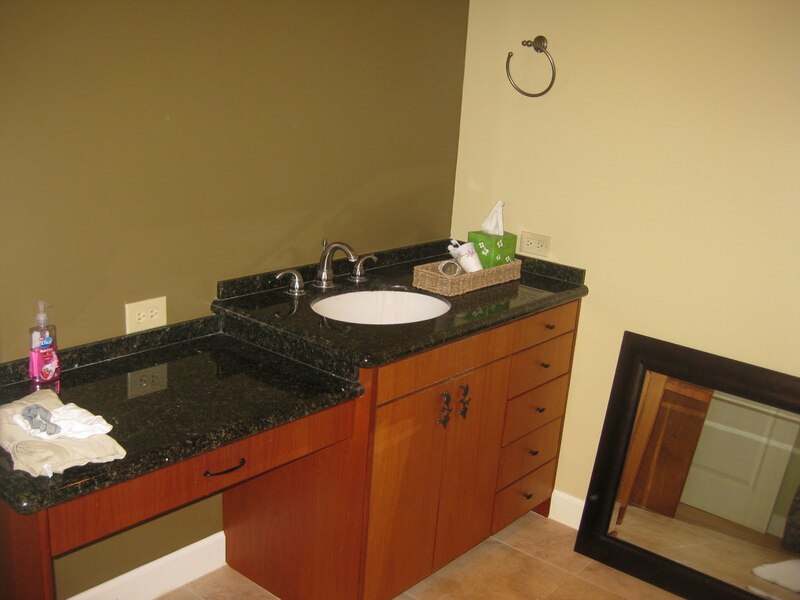 This entry was posted in Bath, Color, Decorating, Home Organizing and tagged bathroom, before and after, beige, black, color, gray, master bath, paint, vanity by organizedohana. Bookmark the permalink. Beautiful that really looks great!